To start with Run time configuration, Log in to Weblogic Administration console of your domain. 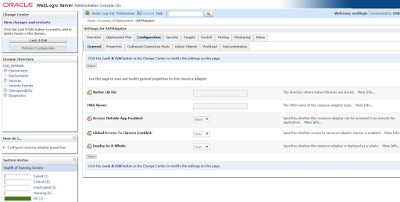 a. Navigate to: Home >Summary of Deployments >SAPAdapter. c. Click ‘Lock & Edit’ in Change Center . Then Click ‘New’ button to create a new Outbound connection. e. Provide JNDI name same as you have given during Design Time, Then Click Finish button. f. Expand the Connection Factory by Clicking on ‘+’ button, You will see your new JNDI. g. Now click on the JNDI name, it will take you to Properties tab. Enter all of the Below properties and hit enter after each entry. These are same properties which was used during Design time. h. Click on the Save button, once all the properties are updated. i. As you can see in previous screen, now we need to Update the Deployment from using the Plan.xml, Navigate to : Home >Summary of Deployments. Check the box before SapAdapter. j. After Clicking on Update button, You will see a screen similar to below. 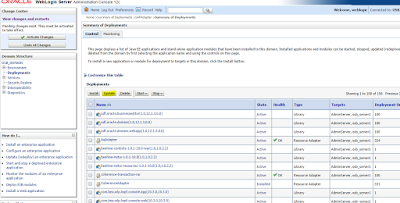 Select ‘Update this application in place with new deployment plan changes’ and Check the Plan.xml location. If not correct, then update the location. l. Now you can deploy the Integration which was created using Jdevloper in Design Time. m. Once Integration is Deployed successfully, you can test it using Inbuilt testing console, in Service bus.